Scottsdale, Arizona plans Mandarin immersion program. 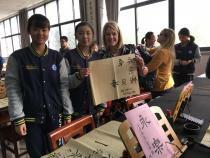 Desert Canyon Elementary School principal Kristin Kinghorn learns calligraphy with students at a school in China. Mandarin Chinese is the most widely spoken first language in the world, and fluency could mean more opportunities in the workforce. That’s why some parents here want their kids to speak it, too — even if they don’t speak it themselves. “It’s a little bit intimidating. But I do realize this is a changing world and we need to support our children. And if this is what’s the right thing for them in terms of their personal development, you’re willing to stretch,” said Maria Aldrich, who attended a recent meeting at Desert Canyon Elementary School in Scottsdale. She’s planning to enroll her daughter in the school’s new Mandarin Dual Immersion Program, which starts next school year. Students will spend half of each day being taught in Mandarin. That led parent Jennifer D’Costa to wonder what homework help will be like.